This week I am in Florida, watching my son's high school marching band parade down Disney's Main Street and enjoying some warmth and sunshine. I thought a good theme for the week would be recipes featuring oranges, so I'm calling this week HashtagOrangeWeek. 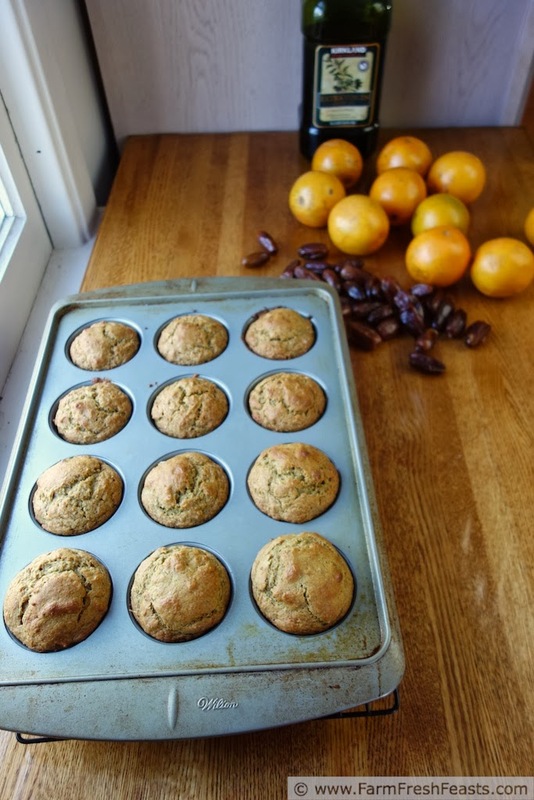 See, the oranges I'm using came direct from Florida as part of the Band Fruit Fundraiser (link to my round up of 156 fruit-filled recipes from 66 bloggers). Why was the band fundraising? To go to Disney and march down Main Street . . .
You ever do something just for yourself? I made these muffins just for me. Normally I make muffins for the kids' breakfast or after school snack, or to bring to a function, or--rarely--to eat with dinner. Not this time. Not these muffins. 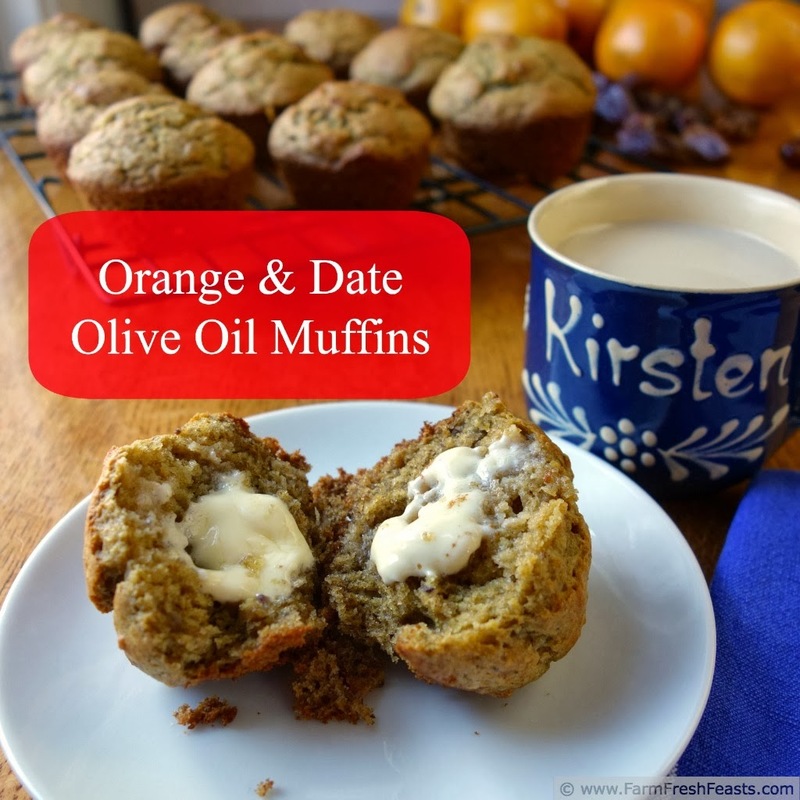 I had a hankering for Orange Date Muffins even though I'd never tried them. Probably due to repeated exposures to the Orange Date Muffin recipe page in Muffins: A Cookbook (Amazon affiliate link) written by friends of my mom. Every time I'd read the recipe over the years, though, I was missing some vital ingredient [like oranges or dates]. Since the Band Fruit Fundraiser Citrus Recipe Round Up, though, I've had cases of citrus at the ready, and as it is sled hockey season I have been to Costco and have dates aplenty. I riffed, a lot, from the recipe--I don't think with oranges and dates much extra sweetness is needed--so I skipped the sweetening. Initially. At the last minute I worried that my other Big Change, olive oil for the fat, would be too . . . . savory, so I added a tablespoon of honey to the batter all the same. 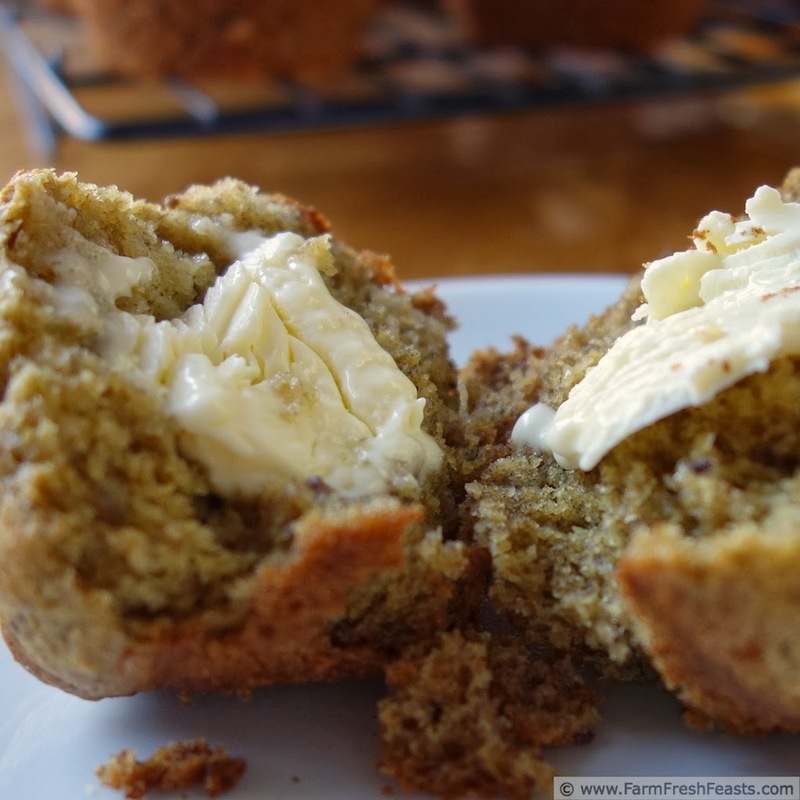 Served warm with a bit of buttery spread, this muffin is light, cake-like, and divine. 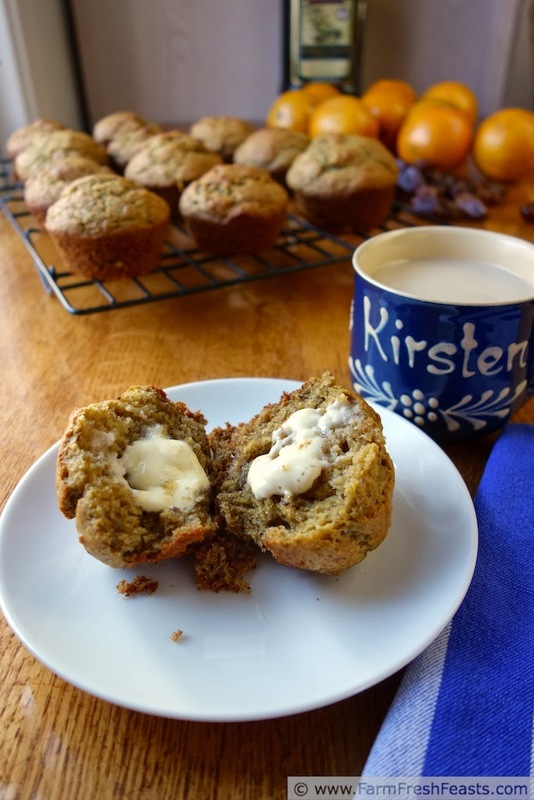 I've made a vegan version of these muffins, too--substituting 1 Tablespoon flax meal and 3 Tablespoons water for the egg, and using molasses in place of the honey. Also delicious. 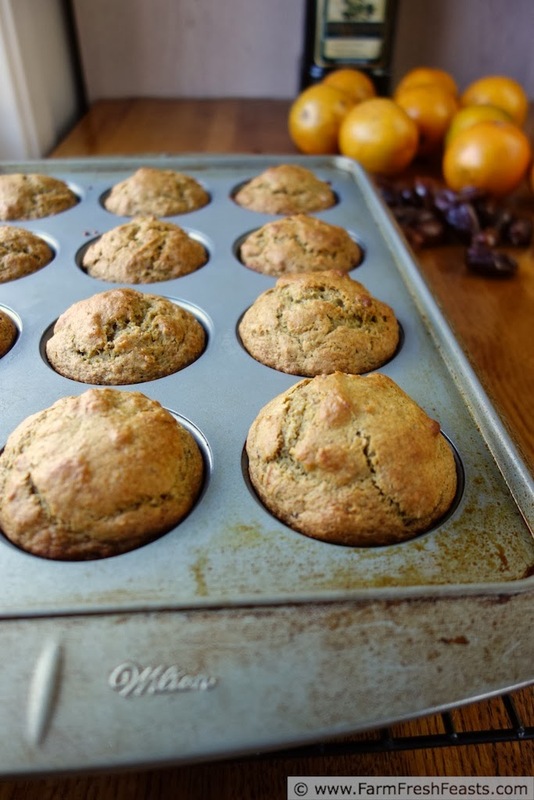 Preheat oven to 400 degrees Fahrenheit and spray a 12 cup standard muffin pan (or line with paper cups). Place oranges and dates in a blender (I use my Vitamix) and blend until finely chopped. Add egg, olive oil, and honey to the blender and blend thoroughly. Pour contents of blender into the bowl and stir until just combined. Scoop** (I love using scoops for muffins and cookies, this is an Amazon affiliate link) into muffin pan and bake for 15 minutes, until tops are lightly browned. Cool in pan 5 minutes, then transfer to a rack to finish cooling or just eat. 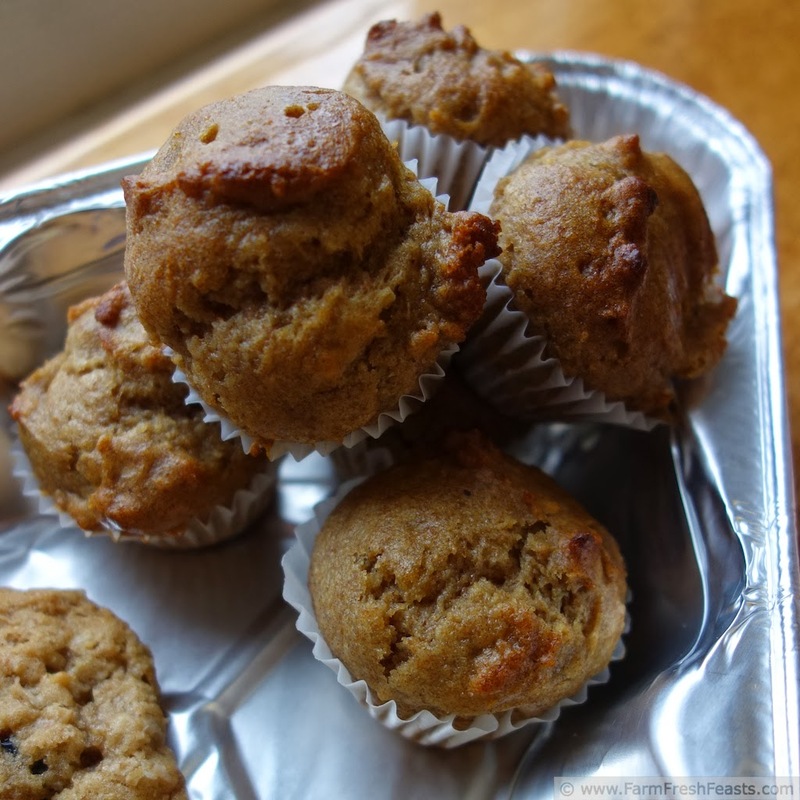 Bake vegan mini muffins for 12 minutes at 400 degrees to give to your neighbors for treats. Well, why not make a treat just for you every now and then?! These muffins look delicious, and I especially like the mini muffins. You deserve a treat! These sound wonderful. Welcome to Florida :) You certainly got a beautiful week! The weather has been fantastic! These look amazing, Kirsten! With another snow storm on the way tomorrow, I'd give just about anything to be walking down Main Street USA right about now. Have a great time! These look super yum! Thanks for sharing! I appreciate the Pin! Thanks for hosting! Oh sure rub it in that your in sunny Florida while I'm stuck snow blowing again. I forgive, but only because these muffins look divine. I met a rhubarb strawberry olive oil cake last summer, and I swear it was the best cake I'd ever had. I can't wait to try these. Thank you for your forgiveness! I won't lie and say sunny Florida was awful . . . :) but I am glad to be home in my own bed. I'm always glad when an idea turns out so well!